In Capital Theory and Equilibrium Analysis and Recursive Utility, Robert Becker and John Boyd have synthesized their previously unpublished work on recursive models. Robert Becker is the author of Capital Theory Equilibrum Analysis and Recursive Utility, published by Wiley. 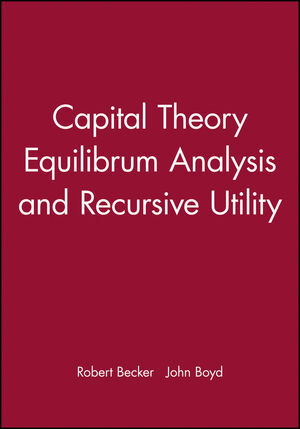 John Boyd is the author of Capital Theory Equilibrum Analysis and Recursive Utility, published by Wiley. Part I: The Recursive Utility Approach:. 2. What is a Recursive Utility Function?. 3. Why Study Recursive Utility?. 3.1. The Long Run Incidence of Capital Taxation. The Tax Model. Tax Incidence with the TAS Specification. Tax Incidence With the Epstein-Hynes Utility Specification. 3.2. The Impatience Problem. The Impatience Problem with an Epstein-Hynes Utility Function. 4. Recursive Utility and Commodity Spaces. 4.1 Diminishing Returns and Bounded Growth. 4.2 Nondecreasing Returns and Sustained Growth. Growth and Exogenous Technical Progress. Endogenous Growth Models. 4.3. Order Structures. Weak Separability of the Future from the Present. Partial Orders on the Commodity Space. Part II: Commodity and Price Spaces:. 2.1. Order Properties. Free Disposal. 2.2 Topological Properties. Metric Spaces. Continuity. Compactness, Product Spaces, and the Tychonoff. Theorem. Connectedness. 2.3. Linear Topologies. Order Convergence. Contraction Mapping Theorems. 3.3. Dual Pairs and Weak Topologies. Part III: Representation of Recursive Preferences:. 2. Preference Orders and Utility Theory. 3. Recursive Utility: The Koopmans Axioms. 3.3. Recursive Preferences and Myopia. 4. Impatience, Discounting and Myopia. 4.1. Impatience and Time Perspective. 4.2. Myopia and the Continuity Axiom. 4.3. The Norm of Marginal Impatience Conditions. 5. Recursive Utility: The Aggregator. 5.1. Basic Properties of the Aggregator. 5.2. The Existence of Recursive Utility. 5.3. Aggregators Bounded From Below. Part IV: Existence and Characterization of Optimal Paths:. 2. Fundamentals of Existence Theory. 2.1. A Simple Capital Accumulation Model. 2.3. One-Sector TAS Existence Theory. 3. Multisector Capital Accumulation Model. 3.1. The von Neumann and Malinvaud Models. 4. The Existence and Sensitivity of Optimal Paths. 5.1. Dynamic Programming with TAS Utility. 5.2. Recursive Utility and Multisector Models. 5.3. Dynamic Programming and Extended Utilitarianism. 6. Characterization of Optimal Paths. 6.2. Complete Characterization of Optimal Paths. 2.1. Stationary States in One-Sector Models. 2.2. Monotonicity and Turnpikes in TAS Models. 2.3. Monotonocity and Turnpikes in Recursive Models. 3. Steady States in Multisectoral Models. 3.1. Stationary Optimal Programs for Additive Utility. 3.2. Stationary Optimal Programs for Recursive Utility. 4. Stability of Multisectoral Models. 4.3. Uniqueness of Steady States. 4.4. Local and Global Stability. 5. Cycles and Chaos in Optimal Growth. 5.1. The Existence of Cycles. Part VI: Equivalence Principles and Dynamic Equilibria:. 2. Equivalence Principles for One-Sector Models. 2.1. The Perfect Foresight Equivalence Theorem. Perfect Foresight Competitive Equilibrium. The PFCE Equivalence Principle. 2.2. The Fisher Equivalence Theorem. 2.3. The Equivalence Theorem and the Transversality Condition. 2.4. Recursive Competitive Equilibrium and Recursive Utility. 3.1. The Portfolio Equilibrium Condition. 3.2. The Two-Sector Model's Equivalence Theorem. The Household Sector. The Production Sector. The Transformation Function. Perfect Foresight Equilibrium. The Optimal Growth Problem. The Equivalence Theorem. 3.3. Dynamics and The Two-Sector Model's Equivalence Theorem. 4. The Transversality Condition and the Hahn Problem. 2. The Reduced-Form TAS Model. 2.2. Comparative Dynamics for Oscillating Programs. 2.3. Comparative Dynamics and Capital Income Tax Reform. 3. A Primer of Lattice Programming. 3.2. An Introduction to Monotone Comparative Statistics. 4. Lattice Programming and the Reduced-Form TAS Model. 4.1. The Monotonicity of Optimal Capital Policy Function. 4.2. The Capital Deepening Theorem. 5.1. Recursive Utility, Monotonicity and Lattice Programming. 5.2. Increasing Impatience and Recursive Utility. 5.3. Capital Deepening and Recursive Utility. Part VIII: Dynamic Competitive Equilibrium:. 2.1. Existence of Pareto Optima. 3.1. Existence of Core Allocations. 4. The Core and Competitive Equilibrium. 4.3. Representation of Equilibrium as Welfare Maximum. 5. Models with Very Heterogeneous Discounting. 5.1. Core Equivalence with Heterogeneous Discounting. 5.2. Specialization to Recursive Utility.